Lyonara is one of the country’s leading contract-providers of cold storage services, with household names such as Glanbia among its customer base. The company recently acquired a new cold store facility in Portlaoise that required a pallet racking system able to cater for its product range in addition to a hostile storage environment of up to -40°C. Euromech designed, engineered and installed a Mobile Pallet Racking system that has provided Lyonara with a storage capacity of 2,500 pallets in an area of just 815 sq metres. Powered mobile racking maximises space utilisation, enabling up to 80% of the floor area to be occupied for storage, compared with 30% for conventional wide-aisle pallet racking. The versatility and efficiency of this system makes it particularly suitable for use in cold stores, bulky multi-product applications, palletised consumer goods and food products. 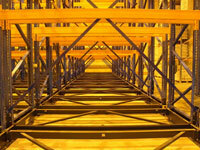 The mobile system comprises conventional racking mounted on a steel framed base. 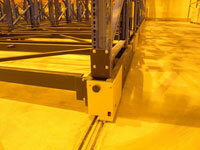 The base is a diagonally braced structure, with electrically driven wheels that run along tracks set into the floor. The mobile bases installed at Lyonara are controlled individually using push buttons on the ends of the racks or from a central, hand-held console. 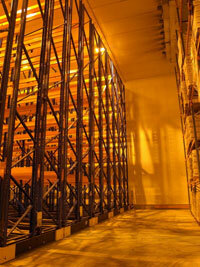 The movement of a single aisle within a solid block of racking exposes the required rack face, which then provides easy access toindividual pallets and facilitates efficient stock control. Safety was paramount for Lyonara, with the design incorporating fail-safe systems to ensure maximum safety for operatives. Infrared light barriers are located at the end of each aisle, with rack movement stopped as soon as the barrier is broken.